It all started with a phone call from my friend. Little did I know that this journey in Asia's longest bus would end up being a journey of twist and turns which I least expected. Gujarat was facing the worst monsoon of the year with power cuts n floods throwing normal life out of gear. With the situation going worse on each passing minute, I decided to pre-pone my return journey to Bangalore. Thanks to operators connecting Gujarat with Karnataka, traveling between these two states has never been this easy. 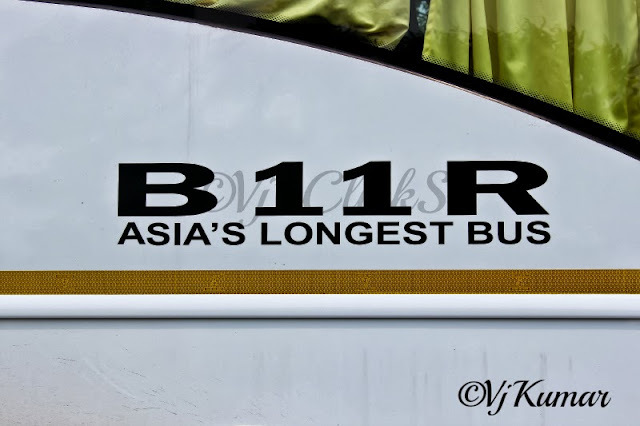 My initial and only choice to return back to Bangalore was via SRS B11R, Asia's longest bus. My friend offered to drop me at Ujala avenue complex, near Vishala Hotel; the starting point of Bangalore and Hyderabad bound buses. Booked my seat n was excited to travel on the only b11r working on this route. The departure was at 5pm and I could hardly wait. The bus showed up at 4:25pm and pulled over near the complex. Something looked amiss and upon enquiry, found that the bus just arrived from Bangalore battling rain and traffic en-route. After dropping the passengers, the bus headed out towards the parking to prepare for the return journey. Rains kept pounding and at 5:15pm she emerged out of the parking lot to pick up Mumbai and Karnataka bound passengers. The bus had around 2.15lacs kms done on the odo. The interiors looked fresh and I finally settled down in my seat. Around 8-10 passengers boarded the bus here. The bus finally moved out and headed towards Nerul. We took few more passengers and parcels and continued further. The rains showed no respite while we slowly made our way out of Ahmedabad. We reached Anand express highway and after picking up few more passengers we headed towards Vadodara. The rains continued to lash on while our bus powered on. Very soon the excitement turned into anticipation as the news started coming in about the traffic ahead. However the comfort of a B11R was enough to put me into deep slumber. 25th September 2013, 20:40hrs- Dinner Time. We pulled over for dinner at a pretty decent restaurant, 30kms from Bharuch. We were joined by another SRS B9R bound for Bangalore from Jalore, a VRL B9R heading to Bangalore and a Neeta B9R. The food was quite good however not overpriced. The crew of all the 4 buses were discussing the traffic situation up ahead and they all had one common information, ‘Horrible Jam up ahead’. After a brief halt, we were the first bus to pull out followed by SRS B9R. We joined the highway and pretty quickly the B9R took the lead and after traveling for about 10kms, we stopped. The cleaner from the other bus came running to our bus and we decided to make a U-turn and re-join the highway on the opposite side. Chaos and confusion prevailed. All attempts to turn the 14.5mtr long bus proved futile. We decided to move ahead and face the ‘Historic Traffic Jam’ of NH-8. While the bus joined the traffic jam, I decided to catch up with my sleep. Rains were still pounding outside and with great efforts I opened my sleepy eyes to face the reality. The bus which should have reached Maharashtra by now was standing at the same place where it was standing last night when I went to sleep. With 12.5hrs, we only covered around 150+kms. I walked up to the driver’s cabin and the tired look on the faces of the crew said it all. Ahead of us was a 30+kms traffic jam which showed no signs of clearing. Bharuch is situated at the mouth of the river Narmada, Traffic had piled up due to huge potholes on Sardar Bridge on Narmada River near Bharuch. To make matters worse traffic on both ends of the bridge had come to a standstill as Police stopped the traffic due to the rising waters levels which were flooding the highway. The queue of vehicle was around 30 km on both sides. As the passengers woke up, it became harder for them to face the reality as Mother Nature had set her own plans to set up this journey. Finally a breakthrough, traffic slowly began to move and finally we moved on. Trucks and buses were seen broken down all along the highway as their engines went dead in the cold rainy night. The power of a B11R engine was unleashed as we swayed around the traffic making our way towards Sardar Bridge. As we neared the dilapidated bridge traffic again came to a standstill. However, this time we were in no mood for stopping. Police had opened traffic on the opposite lane and we quickly grabbed the opportunity with open hands. At 9am, we finally crossed the Sardar Bridge and headed towards Surat. We crossed Ankleshwar and pulled over for our Breakfast. Though we were delayed beyond the scheduled time, the crew did not hurry the passengers. After a heavy breakfast, we resumed our journey towards Surat pushing the pedal to the metal. We encountered small packets of traffic en-route Surat however nothing major to delay our journey up ahead. However the surprises of this journey were not yet over yet. We reach Surat at 11:30am and confusion prevailed. 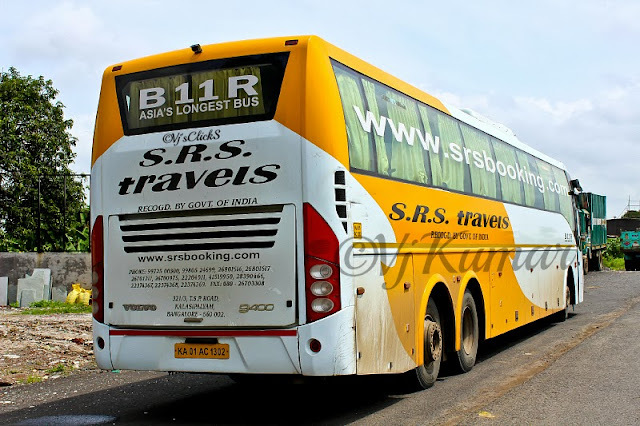 We had around 3 passengers of our bus and 4 passengers of the SRS B9R (Jalore-Bangalore) to be picked up at this point. Unfortunately the B9R from Jalore did not take the opposite lane before Bharuch and when our crew contacted them, they had just crossed Bharuch and were pulling over for Brunch. Incessant rains in the Surat resulted in heavy water logging at number of places and normal life was thrown out of gear. We pulled over on the outskirts of Surat to pick up passengers who were waiting for the bus from 8pm, the previous night. However due to heavy water logging neither the bus could reach the pickup point nor the pickup vans could reach the bus. Finally, passengers had to wade through knee high waters to reach the bus. This ensured a further delay of 1.5hrs. Once the passengers boarded the bus, we moved on. It was planned to shift the passengers of the B9R bus near Vapi when we pull over for lunch. As planned we proceeded towards Vapi without any further delay maintaining good speeds. Fatigue slowly started to take over as we were about to complete 24hrs into this journey. We pulled over for lunch near Vapi. Within few minutes, the B9R arrived to pick up her passengers. Since her passengers were having lunch she waited and left immediately left after picking them up. After a couple minutes, it was our turn to re-join the highway and as we neared the Maharashtra border, we overtook the B9R and powered ahead. We pulled for diesel ah Maharashtra border. The beast gulped a whooping 400ltrs of diesel. We resumed our journey again and decided to go via Thane to avoid heavy traffic and it turned out to be a good decision. After dropping few passengers at Thane we headed towards Kalamboli We were joined by a Shimoga bound Airavat Club Class and a National Chandini who decided to keep us company through the scenic ghats of Lonavala. We maintained decent speeds on the express way and ensure no further delay as journey was into its 2 day. We reached the outskirts of Pune and after dropping few passengers at Hinjewadi Bridge we proceeded further for our dinner break. 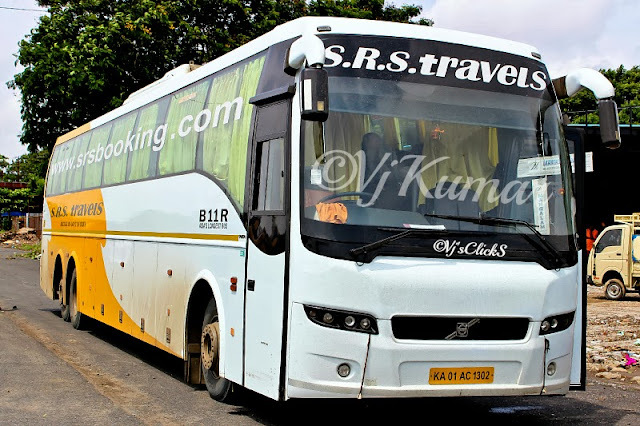 We joined a VRL sleeper, Neeta B9R heading to Bangalore. Dinner break was brief as everyone wanted this marathon journey to end which was into its 30th hour. We resumed our journey and I resumed my sleep. When I woke up, we were in Belgaum dropping off passengers at Ramdev. I fell back into sleep again and the comfort of the bus ensured I slept peacefully. I remember the bus pulling up at Davangere to drop off passengers on the highway. Finally at 7am I woke up as the bus pulled into its last break for the journey near Sira. Within minute we were joined by National’s ‘Chandini’. I am not sure if I will be getting a chance to travel again on this route however rating this journey based on the experience I had would be very harsh. There is no force that can stop Mother Nature when she gets angry and the outcome of my journey was because of one such anger. Needless to say that the crew did a stupendous job as they were driving the bus non-stop for 4 days battling rain, traffic and fatigue. All throughout the journey the crew ensured the passengers comfort was never compromised and they did all the best they could. A big thanks to my friends who kept in constant touch with me during this marathon journey keeping my spirits up. My first ever longest route covered in a bus- Ahmedabad-Bangalore. Marvelous work!. Blog is brilliantly written and provides all necessary information These birds are looking awesome. I really like this awesome post. Thanks for sharing this useful post. Thank you for share beautiful and wonderful pictures. Thanks for the effective information. If you have any requirements for Taxi Services in India then you can book through our website.